1. In a large bowl, mix 1 ½ cups of water, 2 cups of Elmer’s glue, and food coloring and/or glow in the dark paint until it reaches a smooth consistency. 2. In a second bowl, mix 1 cup of water, and three tablespoons of Borax detergent. 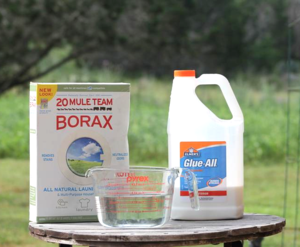 Note: Borax does not dissolve in the water, you must continue to stir it, so that you can keep it suspended in the water. 3. While one person stirs the water & glue mixture, a second person pours the water & Borax mixture into the bowl with the water & glue. Note: You must keep stirring the water & Borax mixture while pouring it. There will be an instant chemical reaction, thickening the mixture. 4. Stir the slime until it is mixed thoroughly. Continue kneading slime with hands. 5. When Slime is smooth and all the water absorbed into it, it is ready. Word of Caution - Slime is FUN, but it does not make a good hat. 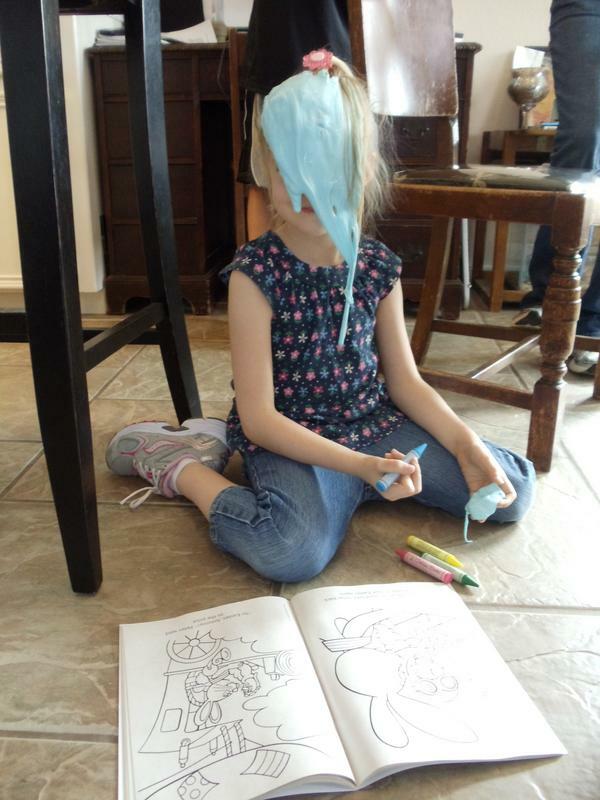 Our 5 year old friend decided to wear the slime we made together. Her mom was able to get it out after washing our friend's hair with clarifying shampoo - took about 45 minutes. Slime oozes down to the scalp very quickly. We rate this experiment as easy, but for ages 8 and up - supervision is recommended! Boil one of the eggs. Put eggs in separate glasses and cover each with vinegar. Label the glasses so you'll know which egg was boiled. Now wait for a day or two - we waited for 48 hours. The egg shells dissolve when the acetic acid in the vinegar reacts with the calcium in the eggshell. Notice when the eggs begin changing. Which egg do you think will bounce the highest - without breaking? What do the eggs feel like when you first dip them out of the vinegar? Do they feel the same or different? Now drop your eggs from 3 inches. If they're both intact still, try dropping them from 6 inches, and so on. Try the experiment again. This time let your eggs soak in water for an additional 24 hours. Does soaking the eggs in water change the outcome? This experiment is easy, but an adult is needed to boil the egg. Even though we labeled our eggs, we got them mixed up! After you try the experiment, you'll know how to tell the raw egg from the boiled egg without using labels! Sign our guest book, and let us know about your results! Bones are hard to bend - try bending a clean bone. Since bones aren't bendable, how are people and other vertebrate animals able to bend, jump, and dance? Slide the pipe cleaner into the straw. Gently bend the pipe cleaner /straw combo. Does it bend easily? Remove the pipe cleaner and cut the straw into one inch pieces. Slide the pieces of the straw onto the pipe cleaner so that they are touching each other. Try to bend the pipe cleaner again. Does it bend more easily? Joints help us move. The gaps between the pieces of straw on the pipe cleaner mimic our joints, and they show how we are able to bend, jump, dance and practice yoga poses. The long bones in our bodies give us support and help us stand up straight. Vertebrae (bony spinal column) are structured similar to the cut pieces of straw and surround the spinal cord to keep it safe. The pipe cleaner represents our spinal cord that runs through the small bones making up our spine. Our back also has strong muscles that support and help keep our spine straight. Exercise helps keep our muscles strong and yoga keeps us flexible. Fill the cup with water until it's almost spilling over. With dry hands carefully slip a paperclip onto the surface. How many tries will it take before you float a paperclip? How many paperclips can you float at the same time? 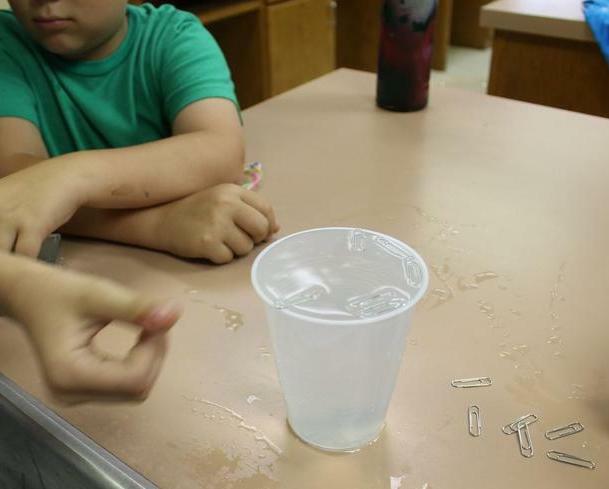 How does changing the shape of your paperclip affect its ability to float? What happens if you try to float your paperclip on top of the water using wet hands? Water molecules reach out in all directions and "hold hands." They are attracted to each other. The water molecules on the water's surface reach out since there are no water molecules above them. When they reach out to "hold hands," they form a skin on top of the water that is called surface tension. The paperclips aren't really floating. Surface tension is holding them up. Surface tension can be broken. If you try to float your paperclip with wet hands, the water on your hands will break the surface tension. 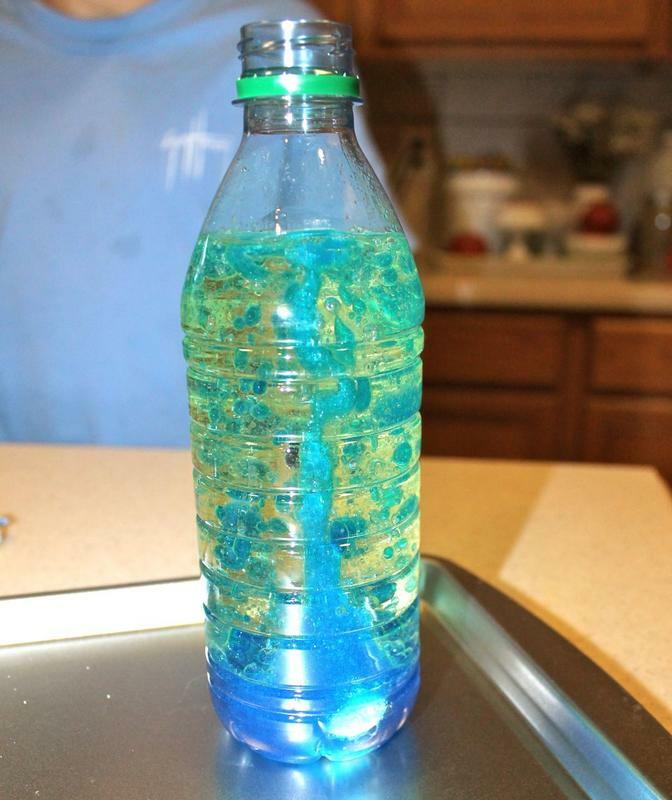 Have more fun with surface tension with this experiment! You will need a bowl with water, pepper, and dish soap. Sprinkle pepper on the water. Does the pepper sink or float? Does it separate or stay together? Now drip a little bit of the dish soap into the middle of the water. What happens? The molecules in dish soap don't "hold hands." A tiny bit of dish soap will break the surface tension. The pepper is pulled to the sides with the surface tension that hasn't been broken. Water droplets are formed because of surface tension. 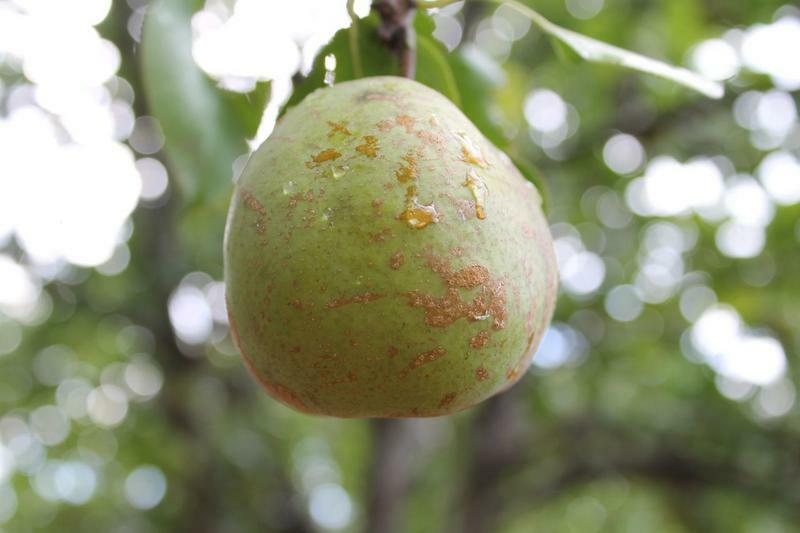 Can you see the drips of water on this pear? Fill the bottom of the bottle with about an inch of water. Slowly pour vegetable oil into your bottle. The oil and water are immiscible, which means they don't mix. Add drops of food coloring and let it settle at the bottom. Drop a tablet or two into the bottle and observe. Will the generic brand of Alka Seltzer produce as many blobs? 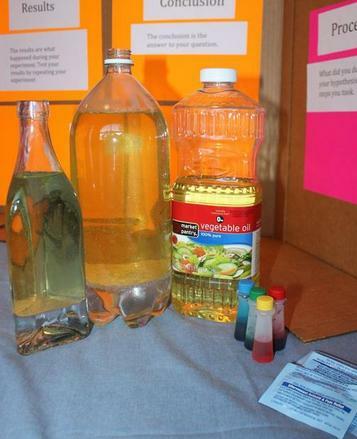 Will the food coloring move as easily through canola oil, sunflower seed oil, or olive oil? Try using several colors of food coloring at the same time. Will the colors mix? Alka Seltzer produces carbon dioxide gas. The colored water moves up through the oil with the gas. The gas is released when the bubbles reach the top and the colored water travels back down through the oil.